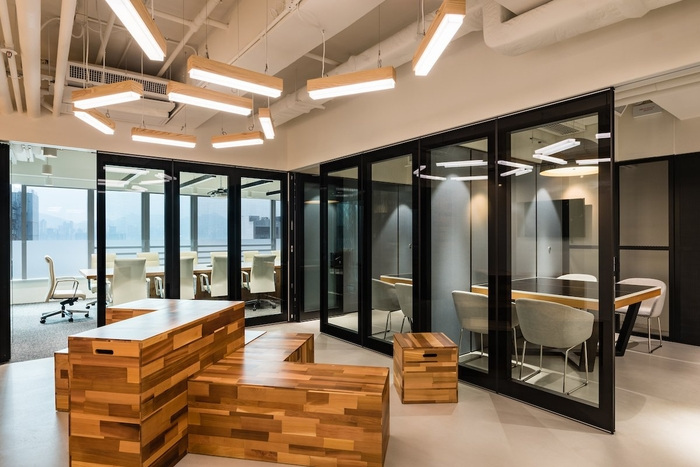 Spatial Concept Limited has designed the new offices of advertising and public relations company Publicis Media Group, located in Hong Kong. Spatial Concept was awarded the design & build project for Starcom, Re:sources & DigitasLBi under the Publicis Media Group. Situated in an office building in Kwun Tong area. The 24,000 sqft office is split into two floors. As the agencies were looking for an outside the box idea, Spatial Concept came up with three very distinct concepts with ultimately the ‘childhood playground’ chosen. The idea of childhood playground brings fun and creativity to the agency office. When the funfair style gate slides open from the lift lobby, a hop scotch floor pattern leads into the large reception area where visitors can view the harbor through a series of glass meeting rooms. The reception counter design is comprised of an oversized ‘wooden stick game’ while a super-size ‘4 in a line’ game is on display along one side of the wall where each coin is actually a stool which can pull out as additional seating for functions and town hall meetings. One of the large meeting rooms is inspired by GoKarts. There is also a small meeting room table which is tiled to resemble tile table games found in the old Lai Yuen Amusement Park. In the office and café areas, graffiti with a ‘Hong Kong’ theme can be viewed on the walls and columns, creating a sense of location. The open-plan layout consolidates and increases workplace efficient, while maximizing natural light and harbor views. The open ceiling and concrete floor reflects the image of the modern advertising agency which has a less “corporate” appearance. Cedar cladded walls provide a richness to the industrial interior design. Different informal meeting areas are located within the office to encourage barnstorming and collaboration.